RTFM, and never trust the dealer. Eight years of frustration could have been avoided had I simply taken the trouble to read my 2007 Prius’ Owner’s Manual when I bought the thing. I’d get in, go to work, and then try to get in the back door or the hatchback to get a briefcase or something, and the door was still locked. A first world problem to be sure, but when it’s raining out, it was a major pain to have to get back in the front door, press the “unlock button,” and then be able to open the other doors. Finally my patience had worn thin enough that I decided to see if it could be fixed. Dang. Whom to trust? I called the first dealership back again, and explained what the other had said. I didn’t want to drive all the way up there only to be told, “Oh, we were wrong.” I got a plate of waffles this time: “Well, we need to have you come up and have the technician hook up his computer and see if your vehicle allows for that function before we’ll know for sure. The diagnostic charge will be $ABunchOfMoney, and if he can change the function, it will be $ALotMore.” Thank you, I appreciate your time. Click. Good thing I didn’t drive all the way up based on the first “Sure, we can do that.” Now what to do? Once again I put it on the back burner. About a month later, I decided to do some more searching on the internet, and I finally discovered this video. Fully half of it is advertising, and the remainder is almost unwatchable, but props to whomever made it because it led me to a solution. The first thing I noticed was that the kid in the video had pulled out the Owner’s Manual. At that point I stopped watching the Cloverfield-style camera work, and went to drag out my own. Really? You mean, the answer might just be in the Owner’s Manual? 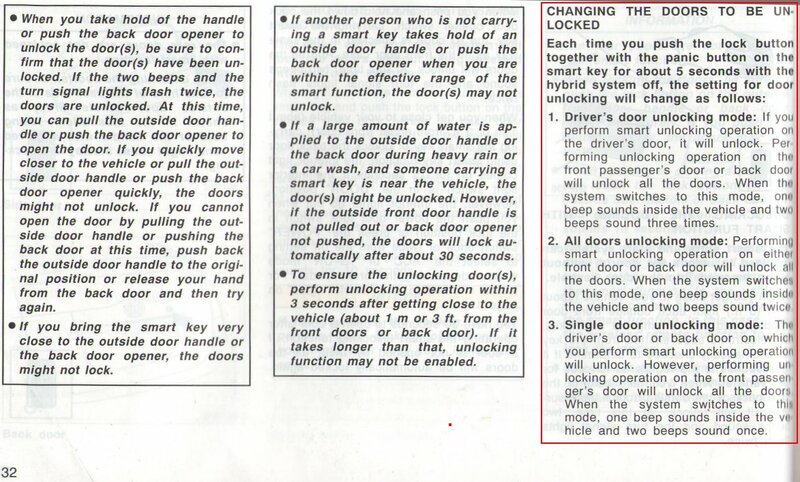 The 2007 Prius has a slightly different manual than the 2008 shown in the video, but sure enough, after a bit of searching I found something in the “Smart Entry and Start System” section; I had to hunt around because the index in the manual was probably written by a drunken lemur pay attention Toyota. So it turns out that if I held down the “lock” and “panic” button together for about 5 seconds, the car makes a bunch of beeps and the unlocking pattern rotates to the next option in the cycle. Done. Free. Heaven knows how much Dealer A would have charged me, or if they would have even been able to figure it out themselves. I’ve learned a couple of lessons here. Lesson 1: If I ever buy a new car, I’ll be sure to Read The Freaking Manual cover-to-cover and take notes. Yesterday as I was happily telling my wife about my triumph, she noted with her usual dry wit that I might even discover other wonderful things if I were to do so with this one. Make it so. Lesson 2: Never trust a car dealership to tell you the absolute truth. Some will outright lie to you, and others just won’t know. Dealer 1 told me that they could fix my problem just to get me in the shop, without even really knowing if the issue was fixable or not. Dealer 2 was ignorant. In the interest of fairness, folks who work in such places are just people; car models change every year, each car has a myriad of different features, and it would be hard for even a top service technician to keep abreast of all of them. Moreover, after 8 years there’s a high probability that the folks working there have only been on the job for a few years and don’t know as much about “older models.” That said, there is a certain expectation of competence when one reaches out to a dealership, so I was left with some residual disappointment that nobody bothered to give me accurate information. But I’m pleased. A small burr has been removed from under my saddle, and the relief is palpable. 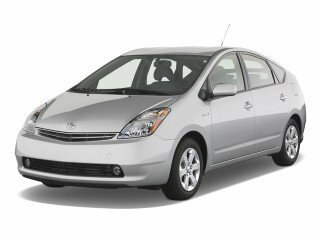 This entry was posted in Cars, Items of interest, Technology and tagged 2007 Prius, Auto Dealerships, Changing Which Doors Open, Owner's Manual, RTFM. Bookmark the permalink.